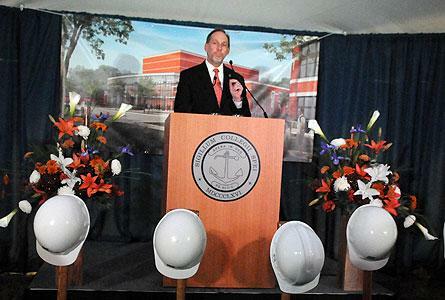 Hope College held a groundbreaking ceremony for the new Jack H. Miller Center for Musical Arts on Wednesday. The 64,000-square-foot Jack H. Miller Center for Musical Arts will include two performance venues, classrooms, practice rooms, faculty studios and office space for the department of music, and is being named in honor of Jack H. Miller for his lifetime of generosity to the college. Miller, who resides in Grand Haven and Naples, Fla., and is a 1954 Hope graduate, led the Howard Miller Company for 48 years until retiring in 2002. The center is among the major initiatives of the college’s on-going $175 million “A Greater Hope” comprehensive campaign, and was inspired by an initial lead gift to the campaign from Richard and Helen DeVos. The total cost for the Center for Musical Arts is $35 million, which includes construction costs and an endowment for maintenance. The groundbreaking took place at the building site along Columbia Avenue between Ninth and 10th streets. Participants included Hope College President John C. Knapp; Dr. James E. Bultman, immediate past-president of Hope; Jack H. Miller; architect Bill Blanski, design principal with HGA; and Dr. Robert Hodson, professor of music and chairperson of the department. The event was followed by a reception with desserts and jazz music. The center will make a lasting difference at the college and in the greater Holland area, playing an important role in both music performance and music education at Hope, in addition to serving as a venue for performances and other activities by community organizations. The centerpiece of the new building will be an 800-seat concert hall featuring both main-floor and balcony seating. The facility will also house a smaller recital hall seating approximately 125 for more intimate performances. Instructional space will include dedicated rehearsal space for the college’s several choral and instrumental ensembles, 17 individual practice rooms, an updated piano lab, a computer lab, a percussion studio, a recording studio and two general-use classrooms. The building also includes 24 faculty teaching studios and offices. The department of music presents more than 125 performances, clinics, workshops and recitals each year. Hope also features concerts through programs such as the long-running Great Performance Series. In addition to hosting performances, the space will support learning by hundreds of students each semester. Hope is making a priority of developing partnerships with community organizations like the Holland Symphony Orchestra, Holland Chorale and Grand Rapids Symphony that could benefit from the performance space. The vision is for the center to become not only a venue for professional groups, but also a resource for area music teachers and area schools for conferences, competitions, and recitals. The Jack H. Miller Center for Musical Arts will be an anchor of the developing arts corridor along Columbia Avenue between Eighth and 14th streets. The arts corridor includes the college’s Dow Center, home to the department of dance; DeWitt Center, home to the department of theatre and Hope Summer Repertory Theatre; De Pree Art Center and Gallery; the Martha Miller Center for Global Communication; and the Kruizenga Art Museum, for which construction will begin next spring. The Jack H. Miller Center for Musical Arts will replace Nykerk Hall of Music which was constructed in 1956 when Hope’s enrollment was 1,100 students. Enrollment today is more than 3,300. Hope College and Holland have never had a venue dedicated strictly for music performance. Over the years, musicians and ensembles have performed at the Holland Civic Center, area high schools, large churches, Dimnent Memorial Chapel, Wichers Auditorium in Nykerk Hall of Music, and the Knickerbocker Theatre. Architectural design for the Jack H. Miller Center for Musical Arts is by HGA of Minneapolis, Minn. Construction manager is G.O. Construction, a joint venture of GDK Construction Co. of Holland and Owen-Ames-Kimball Co. of Grand Rapids. Site work is scheduled to begin in the latter part of November, with the start of construction planned for February of 2014. Completion is anticipated in the fall of 2015. Pianist Adam Clark will present a faculty recital at Hope College on Saturday, Oct. 26, at 7:30 p.m. in Dimnent Memorial Chapel.